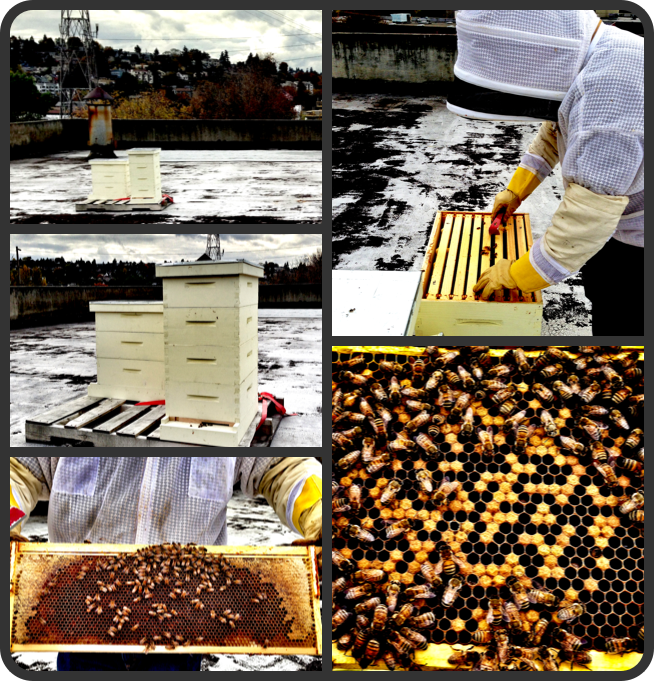 Peter Nolte manages his hives on the roof of Savage Color Printing in Fremont. There's nothing we love more than supporting local businesses, especially when their employees are doing something to give back to the community. That's exactly what Peter Nolte at Savage Color Printing in Fremont (www.savagecolor.com) is doing. When he discovered that his office building had a large, accessible rooftop, he inquired about establishing beehives so he could easily care for them when needed. He was given the go-ahead and now hosts four active hives. With the rapid decline in bee populations, and the desperate need for more pollinator pathways, using a commercial roof to host bees is a very good use of otherwise abandoned space. Starting on Oct. 1st, Monsanto and friends began airing TV commercials in California to spread pure lies about Prop. 37, the fight to label GMO foods. The lies say that it will increase costs for consumers, clog the courts with frivolous lawsuits, make for "confusing" labels, and bring "nightmares of paperwork" to poor farmers and grocers. None of this is true. There is already a standard for labeling food (obviously) that has been understood and effective for all food producers and grocers for decades. Prop 37 will simply require that ingredients that are GM (genetically modified) be labeled as such. So who do you believe? Will it drive consumers into bankruptcy if food distributors have to include the two letters "GM" on an ingredient label that's already being printed? Will you, the evidently "brainless" consumer, be overly confused between the words "corn" and "GM corn?" Prop 37 had a 26% lead in the polls before the ads started to appear, and a new poll today shows that our lead has dropped by 19%. SHOULDN'T WE HAVE THE RIGHT TO KNOW WHAT'S IN OUR FOOD? Cucumber Mint Caprese - A new twist on a classic appetizer salad! This simple recipe takes the traditional Caprese salad to Pacific Northwest heights. By placing a thin slice of fresh lemon cucumber on the bottom, and swapping out the basil for a mild leaf of pineapple mint, we leave room for the bold taste of balsamic vinegar muddled with fresh green figs. Large mint or basil leaves. Slice the cheese, cucumbers and tomatoes equally for your caprese layers. Muddle the insides of the figs with the balsamic vinegar to spread on top of the finished layers. Olive oil can be drizzled for a subtle additional flavor! Serve and enjoy. 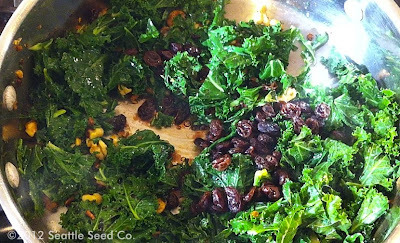 4 cups (or more) of chopped kale. Curly kale works best but any will work. Place oil in a saute pan on low heat while preparing your ingredients. Soak raisins in just enough balsamic vinegar to cover the raisins. Once oil has warmed up, increase heat and toss in chopped garlic and walnuts and allow to brown while stirring. Add chopped kale and stir until covered in oil and the kale turns bright green. Add plump balsamic raisins and stir to mix all ingredients. Serve and enjoy! In this article we'll talk about the differences between determinate and indeterminate tomatoes and if/how it affects your garden plans. First and foremost, you should still select your tomatoes for their physical characteristics and your personal preference. Color, size, sweetness, disease resistance, time to maturity, etc. These are independent of their determination as the world's most delicious tomatoes are of both types. Whether a tomato is determinate or indeterminate describes the growth pattern of the tomato and the total harvesting period. Determinate is often abbreviated Det., and indeterminate Ind. or sometimes Indet. Determinate varieties, such as Washington Cherry, produce tomatoes all at once, and are a bush-type tomato that generally do not need staking or pruning. They often stay more compact, and are recognized because the stems terminate in a cluster of fruit. This stops the stem growth and the plant in finished once all the fruits have matured. All tomatoes on a determinate plant will mature around the same time, leaving maybe a 2-week period during which you can pick and eat the tomatoes. These varieties are sometimes chosen by canning enthusiasts because the entire process can be planned and executed at once and then the plant discarded, making room for more vegetables in the garden. Indeterminate tomatoes, such as Brandywine, Green Zebra, or Black Krim, produce fruit over the course of the season instead of all at once. They also tend to grow much larger and often require staking or trellising in order to support the weight or quantity of tomatoes they can produce. Because the plants can get so dense, pruning is recommended so that all the leaves can get sunlight and make more tomatoes. We discuss pruning and staking in a separate article. If the leaves are struggling to get sunlight, the plant will produce more leaves in order to find the sun. This results in your plant using all its energy to create leaves, and therefore less energy making sugar, thus fruit. Many cherry varieties and most heirloom varieties are indeterminate, though you simply need to check the description of your plant to make sure. Now that you know the difference between determinate and indeterminate tomatoes, you can plant your garden so that you have tomatoes all season long making the proper use of space. Sometimes gardeners will plant a determinate variety next to an indeterminate one so that two indeterminate varieties don't get tangled up with each other. Other times people will plant one or two indeterminate varieties where they have room for a trellis or stake, and plant determinate varieties in pots on the patio where a cleaner, more compact plant is desired. Indeterminate varieties are great in Topsy Turvys™ because they can make long vines that produce hundreds of tomatoes without needing additional staking. Determinate varieties can often be grown next to lettuces and carrots because they will provide shade for them while minimizing the risk of taking over the entire area or crushing the plants. Handmade up-cycled leaning vegetable trellis. A fresh new take on veggie trellising! Instead of making your cucumbers (or other veggies) climb straight up, this homemade trellis leans against the house. It's also very sturdy and doesn't have to be buried in the ground. Once the cucumbers grow in they will also provide a shady spot for carrots, radishes and leafy greens to grow! Thanks to Rosy Clover for giving us a tour of their garden!